The A57 features the (refurbished) essentials of its predecessor’s spec sheet while also including progressive-scan video, artistic filtering, greatly improved battery life, and a better-crafted finish (on the same level as that of the SLT-A65). If there is one single thing that can characterize the SLT-A57, it would be its Sony 16Mpix APS-C CMOS sensor, praised for its image quality at record high sensitivity and dynamic range. Still, in 2012, we rather expected Sony to implement a new generation of CMOS sensor, rather than keeping the same sensor that came out two years ago. This said its sensitivity has been increased to 16,000 ISO (vs 12,800 ISO for the SLT-A55), which leads us to think that Sony has been refining the signal processing algorithms of its own sensors (which up to now had been an area in which Japan had been surpassed by certain competitors who had learned to take more full advantage of Sony’s own sensors —but we digress). Its fast acquisition frequency combined with SLT (single-lens translucent) mirror technology allows the Sony to offer the Alpha 57 with burst shooting up to 12 i/s, Full HD video recording with progressive scan 60p (the SLT-A57 has a microphone input), HDR shooting, and capture by scanning of both 2D and 3D panoramic photos. While the Sony Alpha 57 retains the sensor along with many other technical characteristics of the SLT-A55, such as built-in image stabilization, it has abandoned the A55’s GPS sensor. Too bad for travel photography! In keeping with the expectations of the day, the SLT-A57 offers iAuto scene recognition and 15 creative effects; in portrait mode, it identifies subject positions and can propose corrections to your framing for optimal rendering. Its 3″ / 921,000-point XtraFine LCD screen tilts on two axes to allow greater freedom in framing one’s shots. Today Sony is concentrating its innovative efforts on its line of SLT cameras. The Sony Alpha 57 is equipped with translucent mirror technology that diverts a portion of the light rays entering the lens (“through the lens,” thus TTL) to a sensor that feeds an electronic viewfinder —not just your classic viewfinder here, but a 1.44 million-point EVF electronic viewfinder. Now, the absence of an optical viewfinder, replaced in the SLT line by an EVF, may be difficult for some photographers to reconcile with their habits and ideas of comfort, but it has some undeniable advantages, such as 100% image coverage, WYSIWYG rendering that permits judging white-balance correctness, the effects of exposure corrections (etc. ), third-party grid display, aiming through an eyepiece when in video mode, etc. The Sony SLT combines the EVF of a compact or mirrorless camera with 15-point phase-detection autofocus (with three cross-type collimators). 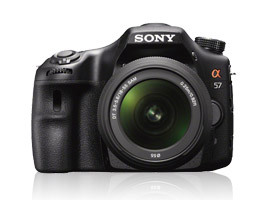 The Sony SLT-A57 with a 18-55mm kit lens is priced at $799 and will be available in April 2012.